VisitScotland hopes coverage of the new Borders Railway will lead to a visitor boom as the opening week of celebrations alone reached an audience of millions worldwide. The launch of the longest domestic railway to be constructed in Britain for over 100 years was covered by media outlets from across the globe, including Canada, USA, France, Germany, UK and Ireland. On social media, the #mybordersrailway hashtag – created to promote the railway – was mentioned 3,980 times on the opening weekend (4 - 6 September) and reached a potential audience of 29.2 million Twitter users. On 4 September it was in the top 5 trending topics in the UK on Twitter. 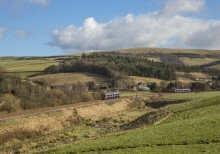 The excitement of the railway is only set to grow worldwide with the launch of a VisitScotland international marketing campaign in the USA next month, followed by promotional activity in Germany early next year. 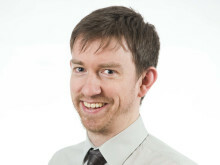 The 30-mile route is set to boost the tourism economy and grow the 11,000 growth sector businesses operating in Edinburgh, Midlothian and the Scottish Borders – which amounted to £21 billion of gross value added to the Scottish economy in 2013. The food and drink sector and creative industries in Midlothian and Scottish Borders alone contribute £103 million to the economy. VisitScotland is supporting attractions, accommodation providers, local producers and pubs and restaurants in the vicinity of the Borders Railway in developing new ideas, products and experiences to further boost the visitor economy which supports 6,000 jobs. “The start of services on the Borders Railway was not only a historic moment for Scotland but a truly global affair with an audience of millions watching both the excellent coverage from the launch weekend, but also HM The Queen opening the line as she celebrated becoming Britain’s longest serving monarch. Supermodel and current Pringle of Scotland muse, Anna Freemantle, joined VisitScotland to launch the railway on 4 September with a special Media Day, featuring around 100 invited journalists, before it was officially opened by Her Majesty The Queen on 9 September – the day that she became Britain's longest serving Monarch. A special ‘Golden Ticket’ Day was held on Saturday 5 September. Public services began on 6 September with more than 2,500 passengers using the service on the first day. 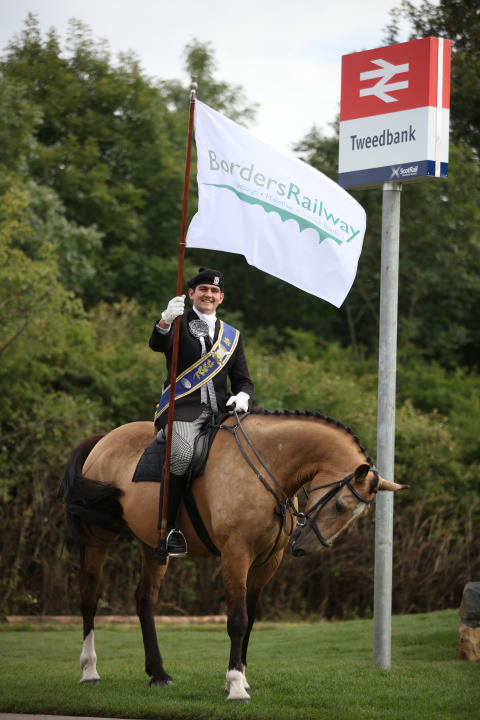 “The celebrations to mark the completion of the Borders Railway were a fitting way to mark the fulfilment of a project that will open up a unique and iconic part of the country to visitors, and a promise made by the Scottish Government to reconnect residents of the Borders to the Scottish rail network and beyond. “Having been there myself at the official opening on Wednesday to sample the atmosphere and feel-good factor I have no doubt that the new line will serve as a catalyst for major investment in the area. "There's a great buzz about the Borders Railway, particularly after such a successful opening weekend, with more than 2,500 journeys last Sunday alone – the first day of passenger rail services to and from Tweedbank. "We're pleased to be working with Scottish Rail Preservation Society to run our first-ever steam trains. These are proving popular with customers and helping boost the Borders economy. Due to the huge demand, we added extra carriages to 16 of our 17 Borders steam trains, with these additional tickets selling out within a week." 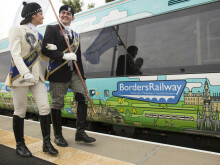 Launch of Scotland’s Borders Railway marks dawn of a new tourism adventure into some of Europe’s most unspoilt regions. The Borders Railway has been officially opened by Her Majesty The Queen today on the day that she becomes Britain's longest serving Monarch. ​The Borders Railway Blueprint partnership, which seeks to maximise economic benefits from the new Borders Railway, today welcomed the Scottish Government announcement that passenger numbers have exceeded original estimates by almost a quarter in the first six months.